After searching online, I found that there were varying solutions to this problem. Some suggested setting up Windows Media Center while others suggested converting your videos to the MP4 format which the Xbox supports. After analysing the different options I decided to convert those videos that needed converting as I lacked a Media Center PC, however I hadn’t realised how many different options you have in regards to software packages that are available for converting video. 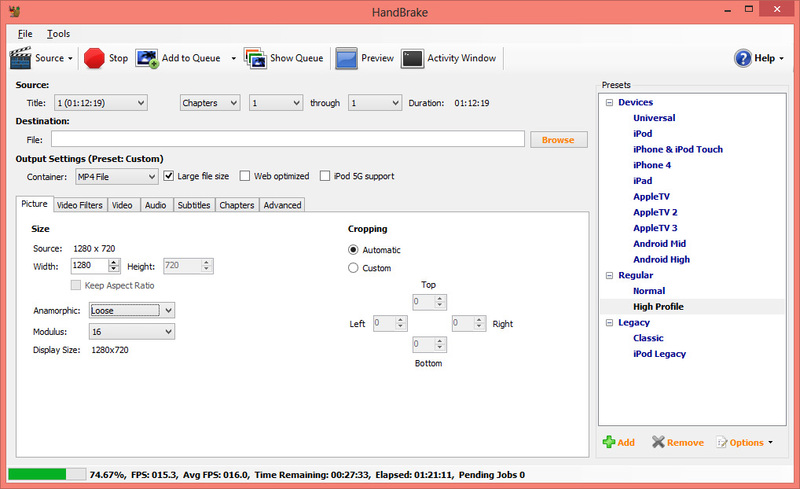 After a couple of hours searching and trying different solutions I still wasn’t happy, until I accidentally stumbled across HandBrake. HandBrake is awesome and is easily the best solution to this problem, the installer is quick and easy and it has no external dependencies; which means there’s no need to install additional software or scripts unlike other programs I looked at like mkvtomp4 which required python, mkvtoolnix, mpeg4ip and ffmpeg – sheesh! It really is the complete package. Installers are available for all the major Operating Systems too (Windows, Mac and Linux) – Awesome! HandBrake comes packaged with ‘Presets’ which essentially are pre-defined sets of options for encoding video to match your target device, there’s no preset for the Xbox – however I had the best results using ‘High Profile’. Other supported devices are iPods, iPhones, iPads, Androids and also the PS3. I really wish I had found this sooner, but for some reason it just didn’t appear in my search results for ‘MKV to MP4’ – so hopefully this short post will save you some time and searching. It also can convert MKV to AVI, WMV, MOV, ProRes, MP4, 3GP, OGV, WebM, MPG, DV, etc.